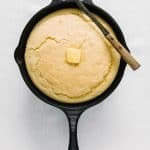 Recipe for Skillet Sweet Buttermilk Cornbread, soft slightly sweet southern style cornbread. This take on an old classic includes honey to give it just the right amount of sweetness. Still had a crumble, but more moist and light than the original. Preheat oven to 425 F. Place butter in 9 inch cast iron skillet and set in oven until melted. Remove skillet and set aside. Sift and combine all dry ingredients into a mixing bowl. Whisk together buttermilk, honey and egg, then add to dry mixture. Pour ingredients into buttered skillet. Bake for 20 min or until toothpick comes out clean. Serve warm with butter, honey, or molasses! !